This is the fifth lesson in our series called “How to Win Against Sin.” It’s based on the Armor of God teaching found in Ephesians 6. Click here to see more Bible lessons in this unit. Read the lesson beforehand and familiarize yourself with it. You do not have to read it word for word. Feel free to make it your own, just be sure to get the theme across. Pray for your class. Shield of Faith activity page for each child. For further information on faith, study the following passages. As you study these, allow the Holy Spirit to work these truths into your life so you can share them with the students. Theme: The fourth piece of armor is the shield of faith. The shield of faith moves to cover our doubts and struggles. The more faith we have in our Lord, the less likely we are to be hurt when Satan attacks. It is also important to remember that our God is always faithful to us. When we take up the shield of faith, we don’t do it through our own strength, but through God’s strength. Give every child a paper plate shield. (A paper plate with a handle made of masking tape on the back.) Have them all line up along the wall. Gently toss crumpled balls of paper at the children. (Not towards their heads, of course.) The kids have to use their shields to block the “arrows” flying toward them. Once they are hit, they are out. They can help throw things, if you want. Play until everyone is out. Once the game is over, have them all sit down on the floor for the lesson. They can hold on to the shields. They will use them later, so they can’t tear them up! Variation: Use a variety of sizes of paper plates. Give some kids dessert plates and others serving plates, for example. Consider giving a couple of kids no shields at all. This helps to demonstrate that the bigger our faith is, the harder it is to be attacked. So for the past few weeks we have been learning about our battle with Satan. God has given us special armor to put on to help us fight. We know that with Jesus, we can WIN AGAINST SIN! Today we are going to talk about a special piece of armor. Let’s sing our song together to figure out which piece we are learning about today. Knights wear a lot of armor, don’t they? It doesn’t seem like there is any weakness in all that metal, but they still need to carry a shield. No matter how well protected a warrior may seem, there is always a weakness somewhere. All the enemy has to do is find the weakness and they will be able to take the knight down. That’s why warriors have shields. What makes the shield different from the other pieces of armor? Have a few students answer. 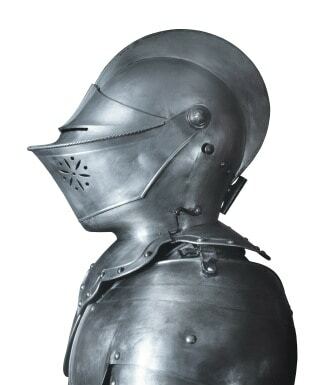 Unlike the other pieces of armor, the shield isn’t strapped on to a certain part of your body. The shield can move to cover weaknesses in a warrior’s armor and keep arrows from piercing through. Great warriors know how to use their shield to protect them from danger. We need to do the same thing with the Shield of Faith. Why do you think God uses a shield to represent faith? Let children answer. Faith covers areas of our lives where we struggle with sins or where we just don’t know the answer to a question. Hebrews 11 tells us of people in the Old Testament who had faith to get through difficult situations, like when Abraham and Sarah trusted that God would provide them with a child. Then when God fulfilled this promise, He asked Abraham to sacrifice his son Isaac. Now think about how you would feel if you got something you really really wanted from God, and then you were told to give it back, you couldn’t have it anymore? That’s exactly what God asked Abraham to do. But Abraham knew that God wouldn’t break His promise. He had faith that God would pull through. That’s because GOD IS ALWAYS FAITHFUL. The shield of faith is not only our faithfulness to God, but it is also God’s faithfulness to us. When we are faithful, it means we completely trust that God will protect us in our war against Satan. The problem is, when we doubt these things, we are not being faithful. That’s why God is faithful to us. He will never leave us. Even when we sin and doubt God, he is still there to protect us. When we believe that, we are picking up the shield of faith. Let’s have a sword drill. Look up 1 John 5:4-5. Once everyone has turned to it, have a student read it out loud. These two verses are telling us that when we have faith in Jesus Christ and follow him, we can WIN AGAINST SIN! Shout it out with me, everyone. With Jesus, I can WIN AGAINST SIN! Now let’s all practice our memory verse together. I will say it once, and then we will practice our motions to help us remember it. “Put on the whole armor of God, that you may be able to stand against the schemes of the devil.” Now stand up and we will learn a few motions to help us learn this Bible verse. “Put on the whole armor” As you say this, pretend to get dressed. Put on your pants and a jacket. “of God” Sign God. (with right hand, thumb facing you, bring your flattened palm downward from your forehead to your chest.) “So that you may be able to stand against” Stand with your feet slightly more than shoulder width apart with your hands on your hips, like a super hero. “against the schemes” Rub your hands together like an evil villain. “Of the devil.” Sign devil. (Put your thumbs to your temples, and your forefingers and middle fingers straight in the air. Bend them twice, like air quoting. Repeat the entire verse with the children, leading them in doing the motions. Poster Review the pieces from previous weeks and add the shield to the children on the poster. Craft: Make shields of faith. Pass out the poster board to the children. On the board, draw a few examples of shield outlines to help get the kids started. Or you can pre-draw the outlines on the poster board. Make sure they take up most of the page. Allow the children to design their shields however they want, as long as they put the word FAITH on it, somewhere visible. Use masking tape to make handles on the back. Pray with your class, then pass out the Shield activity sheet. On the arrows, write some things that can challenge your faith. (Hard questions, being teased for your faith, etc.) With nonreaders, have them draw the challenges, or simply discuss them together. Color the shield. These can be done in class or taken home to reinforce the lesson. the normal telling of this story. Thank you so much for all of the awesome lessons you have shared. We are going to start this series Wednesday night. God bless you an thank you again. In Christ…we are fighting, but Jesus has already won the war and has Victory. This is a really great selection of lessons that can be used to teach children about the Armor of God and to use before they go back to school. Thank you so much for taking the time to put this together and then sharing it with others. You make my teaching Sunday School much easier. Tony Kummer (Editor) reviewed & updated this page on : January 28, 2013 at 10:23 am. All our content is peer reviewed by our readers, simply leave a comment on any post suggest an update.